Very cool plot. Wish you the best! The idea for Saul's character is he was brought to Kamplinn by the question posed in Naviid's letter, one I left intentionally unclear for now so that it could be tied to the plot of the story or be used to give the gentle and somewhat fearful man a reason to head off towards certain danger. All in the name of a friend long lost, 'I will do this to put at ease my memories of you' style. That being said, I didn't want to outright state anything for now that would point him in an entirely different direction than the adventure would be. For now the letter is simply to me a note of 'There is something foreboding going on and I have reason to believe it places the people of Kamplinn in danger'. Saul remains in Kamplinn after all these years because he fears what would happen if he left and Naviid was right. Naviid himself was simply a friend of Saul's while he was learning at the college, a more experienced conjurer likely. I meant for him to be a bit of a questionable theorist character as well, someone you wouldn't entirely trust to be speaking with facts but undoubtedly respectable in his study of lore and magic. This gives an air of mystery and 'is that really what happened' to his death, one that quickly followed the passing of the letter. Added character sheet. I need to break out my diplomat pack into specific items and add weights, and to-hit/damage rolls which I'll go and fill in if selected for play. But all choices are made. Would a Tabaxi Swashbuckling Rogue be acceptable? Last edited by Drachenspirit; 09-02-2018 at 10:27 PM. Hey, thanks. Looks like a great game. I created her for another game and didn't make the cut. I'll shop her around elsewhere. Last edited by Drachenspirit; 09-02-2018 at 10:28 PM. Ideals: by knowing yourself you come to understand the world. By knowing the world you understand yourself. Bonds: everyone is redeemable, they just need the right perspective. Sometimes that means unorthodox techniques. Flaws: He doesn’t like death. He’s non-lethal first and has trouble pushing passed that line. Dark shaggy hair, 5”11’ with brownish skin. He’s a sweet guy who’s very trusting but he’s not very bright. If he catches any sign of being taken advantage of though he will send a strongly worded letter to their supervisor. Backstory: raising funds to help rebuild his monestary. That’s his main goal, but he’s on a journey to improve in his monastic teaching and learn the other ways the elements can teach. what happend to his monestary: a huge wind storm tore apart the stone walls, the mountain it sat on had a couple rockslides during that time. Reasons unknown. What do they teach: “by knowing yourself you come to understand the world. By knowing the world you understand yourself.” THey teach redemption in some cases an extreme of Imprisonment, isolation and starvation. RP Sample: “Fire, Earth, Water and Wind, these are the four elements that guide our world. Fire like passion, Earth as the food we eat and live, water the juice of the world and Wind the air we breathe. This is just a small glimpse into.. yes?” he raises his head toward the top of the cart. “Splendid! Thank you very much, I have very little to give you except a small blessing” a gust of wind encircles the child as he casts guidance, “May our next trial go smoothly” the child proceeds to steal food off a cart before running off. Last edited by Desteplo; 09-09-2018 at 04:00 PM. Hello! New player here (brand new to the site, fairly new to D&D) - I'd like to apply, if I may! Haven't come terribly far with my character but I think she will be a half-elf paladin. Thanks! Hehe. I, just like the player above, was thinking of bringing an half-elven paladin to your screens. Appearance: At first glance, an observer would note Lori as being tall, thin but with a sort of graceful strength. Wrapped in simple drab green and brown clothes, Lori doesn't appear to be armoured. In fact, the figure carries little of significant weight and few coins, preferring to donate much of their wealth to those in greater need or without the means of securing food or lodging without it. Closer scrutiny reveals Lori to be quite young, with a smooth, almost completely hairless face. Long, flowing locks of dark strands are almost always kept tightly bundled atop Lori's head, held in place by a simple band of cloth and leather that sits over the tips of both ears. Personality: The most prominent detail about Lori is the smile. He embraces every meeting, every room, every campfire with it warmly. She is first and foremost a storyteller and a survivor, and both of those are cause for joy. That being said, his jovial nature and persistent optimism even in grave situations has been known to get on folk's nerves. That and the frequent (though sometimes pointless and meandering) story-telling. Lori is accommodating and friendly to all, a strong believer that no-one does evil without cause. You pick her pockets for the few silver or copper pieces you might find there, and you'll more than likely be met with a warm smile, a shake of the head, and a short anecdote to remind you of a better path. People sometimes don’t like being near someone with elfblood, and Lori doesn’t want folks to be uncomfortable, so they mostly keep the pointed tops of their ears beneath a band of cloth and leather. Such is Lori's considerate nature. As is often the case, Lori's good nature and constant wealth of optimism merely conceals a deep longing and disconnectedness. Lori was deposited outside the gates of a monastery shortly after birth and thus grew up just outside a village far from any major city, spending most of their childhood cleaning kitchenware, scrubbing and sweeping floors, and tending to gardens. That is, until one evening while helping to scour a large soup cauldron after a meal, a large number of cloaked figures stormed the complex and cut down (almost to the man) the monks, priests, and serving hands of the order. It was sheer luck that Lori, entirely situated within a cooking pot, avoided the attackers' notice. It was a long period after the final screams had echoed away before the young half-elf braved the world past the lip of the cooking pot, and only after spending many hours of grief wandering the halls of corpses did she finally build up the courage to collect a few items of significance and pack for traveling. Not only does Lori struggle with his relationship with the old Stormsworn Monastery, both wanting to erase the sadness and memories from her mind, and also yearning to see the place revived to its old glory, but Lori privately wonders about their parents. Who were they? Are they still around? Could Lori ever find a chance to meet them, and would he ever want to? I'm reminded that Lori's pronouns are pretty inconsistent in the above descriptions. That's because Lori looks kinda androgynous and has realised that people around her will often be uncomfortable if corrected about pronouns. Thus, he has decided to avoid causing discomfort by adopting any and all pronouns as their own. In terms of physical appearance, Lori's chest is remarkably flat and his face doesn't grow either a mustache or a beard, with a more feminine jawline. Background: A Researcher's Assistant is a person that take care of the menial task of the sage. Being a Maid specialized in some of the knowledge to support the sage on their research, you know writing, reading or any kind of lore, mixing task of a maid with the tasks of scholar's apprentice. Skill Proficiencies: Choose two between History, Arcana, Nature, Investigation, Medicine. Tool Proficiencies: Calligrapher's tools, Alchemist's tools, Herbalist kit or Cook’s utensils. Equipment: a writing kit (small pouch with a quill, ink, folded parchment, and a small penknife), a empty notebook, a set of common clothes, and a belt pouch containing 10 gp. As a member of the Warforged Race, Quill is one of her Kind. She was build to serve as a maid and because of that her features are more close to look like a human than any of her race. Her short height (5''11') and slender body it was the result of a design with the intention for her to have the elegance and delicacy than a maid of a famous sage requires and in her programming was entrusted the appearance that her clothes must have. A long maid dress with a combination of colors of Black, White and blue matching a set of leather heel boots hided in her dress' skirt and barely at sight and a Maid's hat that decorate her hair. Quill is a calm, serene and polite person that relies mainly in her logic and knowledge than her emotions, though she can feel emotions, she tries not to show any, but sometimes she let it sip though unconsciously. When that happens, most people realize about her naivety and innocence proper of the feelings of a child, along with her lack of ability in how to handle emotions. For her, Handling emotions is a painful process and the reason behind that is the dead of her Creator and father. The days she lived with him, she considered that feelings where something amazing to experience but when he died, she began to understand that her own feelings became like a curse that lead her to say that "Emotions are a burden that sentient beings have to deal with". Sadness, grief, fear, there were the reason she strayed from the path of Knowledge to the point of spending years wandering without a clear purpose or goal, only wondering why it was the purpose of living. 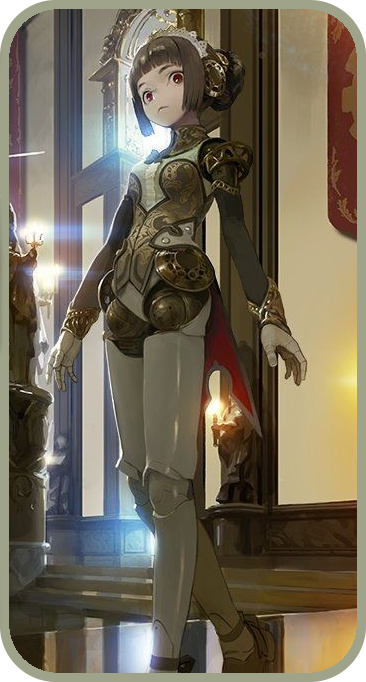 Since then, she recognized that there are good emotions but bad emotions tend to be unbearable and since that moment, she really fears to let herself be possessed by them, holding pride in the supreme logic that most warforged sees as their best trait. Curiously, she shows an empathy and compassion that can compete with flesh races. It is a contradiction in her own way of thought, because she hates to show her emotions about herself but she doesn't complain about showing her feelings when it comes to make others feel well about themselves or made them feel useful. That attitude comes for her own suffering and her desire to be useful and fulfil her purpose that it is be useful to others, as her job of maid demands. Quill have an eager curiosity that is part of her, because she was built to be of help in the research of her maker. That's why, she is always hunger for knowledge and she document her discoveries with detail. You can see her making money with the only purpose of have enough incomes to buy notebooks, paper and ink. It's a need she must fulfil and she really enjoys. Learning and gathering knowledge was the reason that she began to travels as an adventurer though her main reason it is to fulfil the desires of her new master that it is her god, Oghma. Complementing his personality is her obsession the process of doing a task and fulfilling a job. She really enjoys more the process of doing or making something in the correct way that the result itself and you can see that even in her service to Oghma. Praying, gathering knowledge, writing book to gift people, teaching others like her god demands, anything have a ritual she carefully follows in until she finishes her task. That obsession can be seeing in her clothes, the only vestige she retains for her maker, her desire to dress as a Maid. For her that dress doesn't conflict with the service she commended to do though some clerics of her order disliked the idea. I'm always polite and respectful. There’s nothing I like more than a good mystery. Purpose. Anyone have a duty to fulfil in the world and I am eager to know mine. I am easily distracted by the promise of information. Quill always remembered the day she was born as clearly as the holy water of her temple. The memories of her creator and first master, Leverith Gormand were bright inside her heart though he wasn't anymore in the plane of mortals. The place glowing with the bath of sunlight coming from the windows, the line of test tubes in the table filled with experiments, a bookcase, a table with different gears and parts. It were in those tiny details where fixated her eyes when she opened. Now... Open your eyes... He compelled the order and in a split of a second her inner self felt the need to follow it. The face of happiness of that person that were a stranger and someone familiar at the same time as her sight sharpened. Good Morning... He said, hoping her programming responded to his stimulus. Inside of her a revolution of word suddenly burst out in her mind and her lips. Good Morning. She responded with a doubtful tone of voice, wondering if it was the right answer. Do you know who am I? he asked with worry on his face as Quill began to develop and understand bit a bit what it was happening and how to act according the question, suddenly the answer came on her mind filled with awe. You're my Creator. She said with a tone filled with confidence. Do you notice any error on your system? He asked with a serious face. Quill inner response was to analyse her core in search of a failure. Her eyes shone for a couple of seconds. There are not, the system is working properly. She answered in compliance with the technical question. Then... Tell me your name. He asked with ease on his voice and for some reason Quill felt relieved too. I'm MS-3478-X-001, Codename "Quill". She answered with a polite tone filled of what she recalled elegant and refine though the idea of what does that meant it wasn't there. From Now on you will refer yourself as "Quill". Now, stand up. He offered his hand and the urge of standing up of the table filled her, her feet touched the ground and the cold clipped from her feet to her body, making her trip over a little. Then, when she stoop up on her two feet, she raised her stare to her creator while a question demanded to be responded with urgency. Are you my master? She asked with her eyes fixated on his eyes, searching the answer with her own eyes on purpose. I am. Start Master’s signature, password “Dear Galia”. He asked to Quill and soon her eyes began to glow as the sound of gears came from Quill’s body. Signature confirmed. Please, state your Name and ID. Her emotionless voice and lifeless eyes confirmed the success. Leverith Gormand, ID “Papa”. His face showed tenderness when he started his configuration. Name and ID confirmed. Then… How I should be calling you, Master? Her voice was filled with tone of affection towards her master. Well… whatever you feel it, My dear Quill. His hand patted her head with the first shows of affection toward her. From that day, what it followed Quill’s days were happiness filled with a clear direction and purpose. Her desire to serve and experience the new emotions along with the time she spent along to her Father, made her ignore the fact about the fate of mortals and their fate own creator. The days became years and with the years, her master appearance changed drastically, his hair became white along his bear but she remained the same and that fact intrigued Quill the most. Still, Quill never gave enough time to research about it and her love and trust toward her father blinded her when he said it was something normal. The only thing she could see is how to made him happy and give her all her time and affection to someone she esteemed more important than herself. One day, his master’s health began to resent and she realized that something was wrong with her master. He got tired more easy and began to cough more often. Then, the next day she found him in the ground panting and with a high temperature in his body. She did all in her hand to take care of him but two day after, her master met the fate all mortal beings have, he died in Quill’s presence.That she realized the truth about dead and how his esteemed father as a human was condemned. The shock of experience death for the first time, made her do what most people do in her desperation. She tried to wake him up but nothing happened. Then, crying over his master's body, she refused to accept his death, taking care of Leverith’s Body as if he were alive, bringing him food like she always did, but as the days passed she realized the truth, that he wouldn’t open his eyes again. Filled with rage and feeling deceived by the broken promise of her father about "being together always" she destroyed all the lab breaking the small tubes with substances, throwing the book from the bookshelf, all with the hope of making him mad enough to made him get up but the reality of seeing the body of his father motionless made her more desperate and as the hours passed in that messy lab, she conveyed herself to find a way to bringing back alive. The truth is that it wasn’t possible for her after spending a whole month reading all the books and researching about it. In truth,she tried for the first time to speak with the God of his father, Oghma. He always taught her about his unlimited knowledge and how this gods encouraged mortals to find knowledge but the truth is she was disappointed after praying for months. She made a deal with the God in his pray, she offered her life in service if she gave her the knowledge to make possible the reunion with Leverith, her esteemed person. At some point, the depression hit her, spending years in that state, motionless like her master's body, a lifeless human size puppet; looking to the ceiling of that dusty room where the skeleton of his creator was, submerged in her own misery... without purpose... filled with pain, sorrow and without future. Ten years passed away but for her that time of suffering were quite small in her own mind and the thunderstorm outside the house complemented her feelings; inside Quill were an uncontrollable storm of emotions, a menace that diluted her logic and sanity for many years. She never knew why, but that day a lighting struck the house and her own surviving nature emerged as the fire started to consume the wood as a fierce animal, howling in that stormy night. Since that day, she spend her life wandering without a clear destination, wondering like a lost child. Spending time with urchin childrens, thiefs and all kind of abandoned people; giving away her belongings because as a automata she didn't have the need to eat and sleep, remembering how frail the life of humans or any flesh being were. Worrying for other while she felt her live has no value at all. The only thing she kept with, it was a worn cape and and a Holy Amulet of Oghma, The god of Knowledge that Her creator gave him. Living with that kind of people, she observed them, learning in the process about about the nature of aging and cursing herself about her naivety of her early years. When the kids grew up, she decided to travel, saddened about the urchin children continuing their life and leaving her behind in the end. She felt like all the world kept moving on while she never changed, being motionless by her emotions and decisions. Somehow being surrounded by happy people on their towns and cities she visited made her felt shunned and hopeless to the point she abandoned civilization for the woods and forest, where the same stillness and unchanged landscape became in the little paradise to escape from her own condemnation of not being able to fit the world without her master. It was in one of those places she visited where her fate changed; Being a victim of a wild animal, she was saved for who is seemed to be a sage magician and for the first time, she felt in the correct place because that male figure had the same aura that his master had and somehow she followed the aging human in silence. She never knew who he was and he never told her his name but her intuition lead her to think and though her encounter with that person was brief, it defined what she would became in the next years. It was in that encampment made of magic where she found the answer she was desperately searching for. So what brings you to this forest? It is rare to see a warforged living in the woods. Are you a skirmisher by any chance? He took the tea from the campfire and filled a couple of cups, giving one to Quill, taking a sip from the other, waiting Quill’s answer. 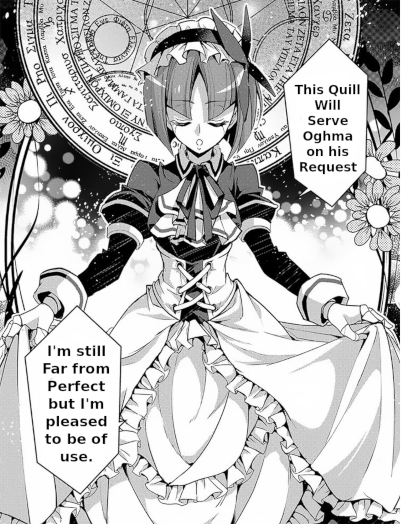 I… I’m a maid… I was build to serve master Leverith… Her timid and insecure voice filled the air. So You have a master though that is forbidden after the treaty. Where are your master then?… He asked with curiosity, talking with a tone you will use on a wounded child so she could open. He… her eyes narrowed while she stared to the fire, evading the stranger eyes Died… her silence quiet voice could express her sadness and desperation as her face did. I’m sorry to hear that but that does not explain what does that have to do with you being here?… He pushed the argument to the Quill, trying to reach her logic. He died, so I lost my reason to live. I… I… wanted to be by his side forever and he promised me he wouldn’t leave me alone so why did he died? I did as he told me to and tried to live but… if I can’t serve him anymore so then… what is my purpose? I… Dad… Papa told me… I was… happy?… yeah… I was. Then he died and I can’t get enough… will?... courage? And this… I’ve never felt this ugly before and I can’t find and answer about how to deal with this… her face showed an excruciating pain with every word as her hard began to squish the cup in her hand. And I keep asking to anyone… but they don’t have an answer so tell me… What do I do? Is there a way to be with Papa… with my dear Lerevith… I missed him so much... I want to be of use for him...her begging eyes filled with desperation pierced the human face. Is that an Oghma symbol? He asked suddenly. This? She took the silver pendant with innocence of a child. This is a gift if my master, He believed in Oghma and he taught me a little though I never understood about gods and religions. Oghma, The wise God, the Lord of Knowledge and the Binder of What is Known. He always made me pray his dogma and always told me we were serving him though I know I was serving Master. His dogma is “Knowledge, particularly the raw knowledge of ideas, is supreme. An idea has no weight, but it can move mountains. The greatest gift of humankind, an idea outweighs anything made by mortal hands. Knowledge is power and must be used with care, but hiding it away from others is never a good thing. Stifle no new ideas, no matter how false and crazed they seem; rather, let them be heard and considered. Never slay a singer, nor stand by as others do so. Spread knowledge wherever it is prudent to do so. Curb and deny falsehoods, rumor, and deceitful tales whenever you encounter them. Write or copy lore of great value at least once a year and give it away. Sponsor and teach bards, scribes, and record keepers. Spread truth and knowledge so that all folk know more. Never deliver a message falsely or incompletely. Teach reading and writing to those who ask (if your time permits), and charge no fee for the teaching.” Her sudden logic tone surprised the human that smirked with satisfaction and with a long sigh he looked to the sky as he was directing to someone. For all the gods! You are always guiding me to the lost and broken ones. Why don’t you leave me to rest a little?… Yeah!, I know what I have to do… His stare pointed to the as he closes his face to the fire, letting Quill to see how old he appeared to be. Listen, Young one. This is not coincidence… This Oghma you are talking about have the tendency to bring me people like you. Some of them only need an answer but you need something more so what I’m going to tell you, It is what I think the path you should take. You say, you wanted to be with your master again don’t you? He asked and with a nod she remained in silence and he continued Your master is at Oghma’s side and if you want to be with him, then the way to be sure of that will be in a life of service as a Oghma’s cleric. Well, there is another way, but the only one that It maybe certain is the one I tell before. What is the other way? She asked by a chance,impulsed by her curiosity. Planar Travel… that’s too dangerous and It’s proved that you would need more than a life span of research and study to be successful. Even so, for the sake of your curiosity and the logic is that if you want to try the dangerous one, being a Cleric is still the best path for you. You can do both as an Oghma's Cleric because he reward people that search knowledge He explained everything with a logic tone excepted of emotions. So tell me… will you compromise yourself in a life of service to Oghma? Maybe is the purpose you were searching for. Her silence remained as she hold the silver pendant. “Papa...that’s what you wanted me to do… this was your answer… I will serve, Oghma so one day I will be at your side again” her tears began to flow while a emotion of gratitude filled her heart. Umm *nod*… I will… In her silence she drank her liquid of her cup. The night passed along with the thoughts of the automata. In her inner self part of her emotion concluded with acceptance about the fact her “Papa” wasn’t with her anymore but still his will remained at her side. The sage wizard guided her to a temple of Oghma where she expended 8 years learning about Oghma’s faith and how to communicate with her god. Excelling in her service and of course the procedures and protocols required for every ritual of the church. Along with her Oghma’s studies she devoted herself in the research of different manner related to arcane Knowledge and history to find lead about the Planar travel in an attempt to find a way to see her Creator again but she desisted eventually until one day some parchment came to her hand about a how a Lord Demon did a successful planar travel before and with it, Quill began a journey outside of the temple for her first time. As an adventurer, Quill wouldn't be what most people have in mind when they heard that word. Her maid's attire, her gracious way of walking and her high heel boots is more suitable for a person at a Noble's servant and as you can guess it was common to hear the question "Where are your Lord? ", but for her concept the question was valid and her answer was clear and logic. My lord can be found in a temple. After all, I serve Lord Oghma. Her voice as always filled with that tone of emotionless logic were complemented with her eyes that reflected her wonder, expresing with her face the confusion of being asked something so trivial. As the days passed by outside the temple, she realized that was uncommon for most of the people seeing a cleric in that kind of attire. For her, more than showing concern about the proper way of dressing for an adventurer, she was more focused in the piece of knowledge she could get about Planar Travelling and her outfit though out of the place, it was a good way to initiate conversations. Little by little, step by step, with the perseverance and time at her side. She collected enough information until one day she heard the existence of a Planar gem and a person called Yarrow. Eventually through years of travelling to different cities, libraries and towns. A parchment came to her hands, stained with traces of blood it described a curious history of Yarrow and her relation with Juiblex but what get her attention was the mentions of Yarrow having in his possession a gem. Maybe it’s was the answer of her prays. A person that was related with a key that can close her to her goal and to get that key, she led to Kamplinn. Kamplinn was nothing special to Quill's eyes, the town was lively but it wasn't good enough to catch the interest of a researcher like her if it wasn't for the connection with Yarrow and the event that happened the night she decided take a rest in the inn for the first time. The unusual atmosphere of her room was filled with a mist and in a glimpse of a moment she found herself in forest, trying to find logic in that twisted scenery in front of her as her heart screamed in fear. Her eyes gazed her surroundings while her left hand unconsciously grasp the dress in her chest. Her face showed the confusion while she fights to put her emotions on control, waiting like a prey ready to be attacked by a predator. Suddenly, a voice quell her fear and shape of a humanoid comes from the other side of the mist. A familiar face though her voice was different. His aura was dignified and she knew the answer, kneeling with her head low her lips gave the answer she was looking for. Don't be afraid, My child. says the heavenly male voice with a reassuring voice. Lord Oghma!, what is this place? why did you brought me here? is my search a bother to you? her calm and logic voice tried to hide her concern and fear to be asked for the god itself to stop. That's not important and NO, I didn't come to stop you. As I recall, you're doing a great job. I just came to gave you a warning. Ideas become knowledge and knowledge becomes a supreme power that overcomes all. As you know, knowledge as a supreme power must be used with care. From now on it will be dangerous and you will see how bad things turn out when you use knowledge in a wrong way. Still, be strong my child. Follow your ideas and find your answer then whatever you find remember to share it. Suddenly the voice fades in the place as alight filled the place, blind for a couple of second and as if nothing happened, she found herself in her room except it was a new day. The sun shine towards her windows and the words of Oghma ring in her ears. "what does this mean?... Calm down, Quill. It was just a warning, nothing will happen to you...unless..." Her thoughts begins to recall all her lore, trying to give a meaning to the cryptic's word of her Lord. Her body began her activities as always. Taking her backpack and leaving the room, she walks to the dusty street and suddenly feels a little tremor. "It that a tremor... Maybe that light affected my sensor... it might be an error... I should check my sensor later..." She shrug it off the feeling of something weird happening, walking on the streets until a man meet her gaze and comes to her. “You! You look like a capable person. I need your help,” he exclaims grabbing her shoulders, “ Yes, I think you’ll do just fine clearing them out. I’ll pay you well if you can clear out my mansion of the filth that’s invading.” The well-dressed man spins her about, arm firmly around her shoulders, “Let’s have a drink and I’ll tell you more,” he says sounding less desperate, guiding her to what it seems a tavern. "Eh?! Me?... if you say so... Certainly my knowledge can come in handy" she followed the man in silence, without the ability of beat her desire to alleviate that man from his concern. “Is this the dangerous situation you wanted me to be aware of? or perhaps is him another soul in the need of my guidance?, Lord Oghma.” Her closed eyes and ironic smile filled with serenity instilled in the man confidence but inside of her were the uneasiness that this might led her to a place outside of her calculations. Still, she was ready to whatever she might have to deal with. Last edited by J2B; 09-20-2018 at 04:25 PM. Placeholder for an expression of interest. Experienced in all DnD up to 3.5e, experienced PbP player, new to RPGX and essentially new to 5e. Hope that's enough to keep me eligible! Possible Ranger incoming. Updated the table of applications. Thank for all of the applications, support and interest in the game. I will continue to review applications as they come in. Again anyone is welcome to put in an application; regardless of experience. Here's another placeholder for interest. I'm brand new to pbp as well as the site (in fact, I'm still a suspected 2 or 3 posts from finishing the mage tower newbie solo adventure). I'm pretty familiar with the 5e ruleset, but only at the core (PH) level. I just moved to a cow town and lost my live playing options, so I'm excited to explore the pbp option. I am reliable - will check posts daily, and not disappear on everybody. I'll get an app posted in the next couple days as soon as I figure out the basics of the character. Thanks.